Overview – Art Expression Inc.
Art Expression, Inc. is a 501(c) (3) charitable organization that was founded by James and Angela Lowden in 2001 as an expression of their passion for alleviating the social inequalities that exist among children of different abilities and backgrounds. It is a fully inclusive after-school program, offered free of charge to students, that focuses on developing the social skills of children through art in the Pittsburgh area.Art therapy is not performed during the sessions, but some of the components of art therapy are used to develop positive outcomes for students. Art Expression, Inc. has served over 10,000 children in urban, suburban and rural school districts and community organizations in Allegheny, Fayette, Greene, Washington, and Westmoreland counties. For 1,000 years, people have traveled to the Chartres Cathedral in France to walk the labyrinth. Arriving at its central point is said to let you feel more spiritually centered. 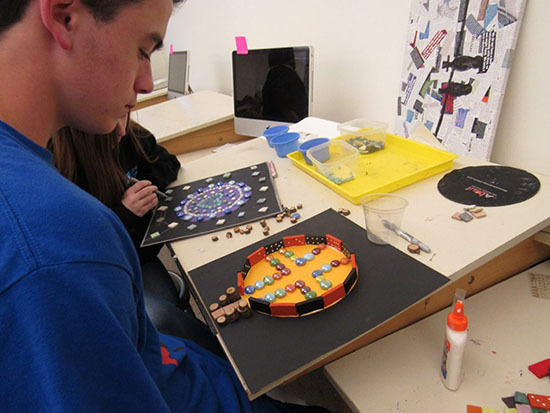 For this project, our students created their own labyrinths to represent the strengths that they use to feel centered in their everyday lives.